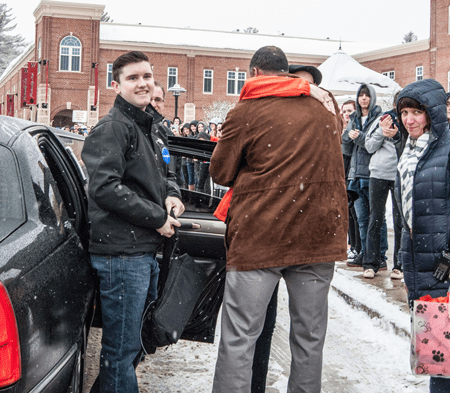 Liam Talbot, 17, of Hanson steps out of a limo as his mother Maryellen embraces Dom Amado of the W-H Guidance Department as they arrived at the school Thursday. Photo by Stephanie Spyropoulos. 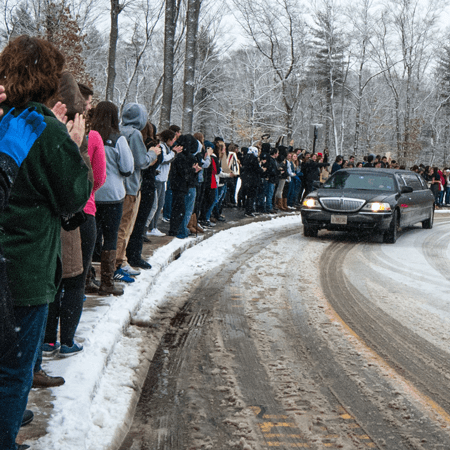 Liam Talbot, 17, of Hanson, a junior at Whitman-Hanson Regional High School, received a roaring send off from his classmates and staff at WHRHS on March 5, 2015. He is the recipient of a trip to Florida through the Make-a Wish Foundation and will be traveling to there later today. Talbot, who sings and plays piano, is reportedly meeting his favorite musician, rock star Gavin DeGraw. Talbot has chronic arsenic poisoning. He was diagnosed at age 2 after seeing 26 specialists. He credits his care and longevity to the Boston Children’s Hospital. He has been told that there is nothing doctors can do to stop the progression of the illness, which has attacked his internal organs. Refer to an upcoming issue of the Whitman-Hanson Express for an interview with Liam and his mother. The entire school gave WHRHS junior Liam Talbot, 17, a giant send off on his surprise trip to meet his favorite musician, rock star Gavin DeGraw, in Florida. Photo by Stephanie Spyropoulos.